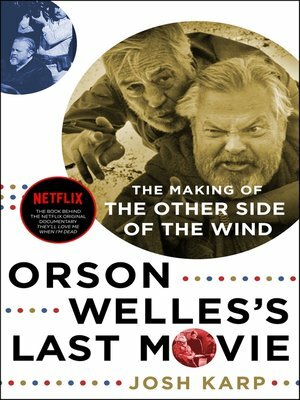 Journalist Josh Karp shines a spotlight on the making of The Other Side of the Wind—the final unfinished film from the auteur of Citizen Kane in Orson Welles's Last Movie, the basis of Oscar-winning director Morgan Neville's Netflix Original Documentary, They'll Love Me When I'm Dead. In the summer of 1970, legendary but self-destructive director Orson Welles returned to Hollywood from years of self-imposed exile in Europe and decided it was time to make a comeback movie. Coincidentally, it was the story of a legendary self-destructive director who returns to Hollywood from years of self-imposed exile in Europe. Welles swore it wasn't autobiographical. The Other Side of the Wind was supposed to take place during a single day, and Welles planned to shoot it in eight weeks. It took six years during his lifetime—only to be finally completed more than thirty years after his death by The Last Picture Show director Peter Bogdanovich, who narrates the film, and released by Netflix. Orson Welles's Last Movie is a fast-paced, behind-the-scenes account of the bizarre, hilarious, and remarkable making of what has been called "the greatest home movie that no one has ever seen." Funded by the shah of Iran's brother-in-law, and based on a script that Welles rewrote every night for years, the film was a final attempt to one-up his own best work. It's a production best encompassed by its star—the celebrated director of The Maltese Falcon, John Huston—who described the making of the film as "an adventure shared by desperate men that finally came to nothing."